Electricity begins its journey at one of many power stations where current is generated. Electricity generators use fuels, or renewable energy sources including wind, water and solar to make power. Electricity is then transported over long distances from power stations through high voltage power lines. In fact Australia has the longest alternating current system in the world. The electricity is then transformed to lower voltages before being distributed to homes and businesses across the country. Generators use fuels, wind, water and solar to produce electricity. They then send the power they produce into the grid. They sell the power they produce on the NEM (National Electricity Market). Distributors own and maintain the networks (power lines and poles) that carry electricity to Australian homes and businesses. The distributors are responsible for interruptions or faults such as fallen power lines. The retailer buys electricity at a wholesale price on the NEM, and sells it to retail customers. The retailer is responsible for getting customers connected to the network, for customer service and billing. 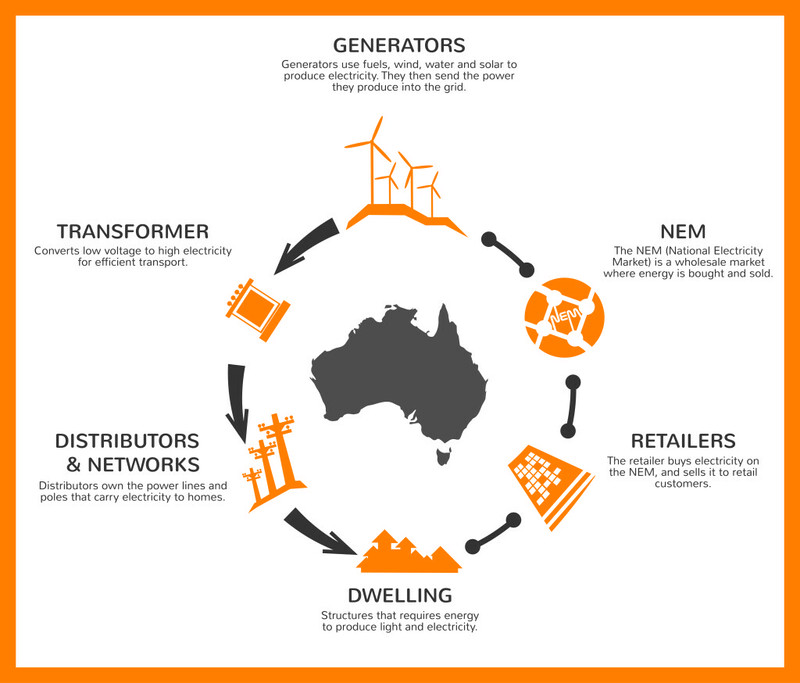 The NEM (National Electricity Market) is a wholesale market where energy is bought and sold. The usually forces of supply and demand affect prices on the NEM and prices fluctuate accordingly. If there is high demand for energy on the wholesale market, prices will likely be driven up. However, generators compete with each other to sell the electricity they produce at the best price. Healthy competition is the best way of maintain an efficient market. The NEM is regulated by AEMO (the Australian Energy Market Operator). Although the grid can transport electricity, it doesn’t store it, so the NEM needs to monitor usage patterns in order to forecast electricity demand so there is always enough power available when electricity consumers need it. In fact in Britain, engineers at the National Grid control center brace themselves each time EastEnders (a popular UK TV drama) ends because 1.75 million kettles get switched on at the same time. So big is the surge in demand that backup power stations have to go on standby across the country, and there’s even additional power made available in France just in case the UK grid can’t cope. In Australia extreme hot weather events can have a similar effect, and very hot days can place a strain on the grid. For this reason, the government established the Australian Energy Market Operator. AEMO is responsible for managing the electricity dispatch process so the system always has sufficient electricity to meet demand. Electricity generators submit bids to AEMO each day, detailing how much electricity they are willing to supply and at what price. AEMO then matches these generation bids with the predicted demand from retailers. The dispatch process works out the most effective and lowest cost generation mix. The resulting price is called the spot price, the wholesale market is settled when generators receive the spot price for the electricity they supply and retailers pay the spot price for the electricity they buy for their customers. The NEM infrastructure comprises of both state and private assets managed by many participants. At over 5,000 km from far north Queensland to Tasmania, and west to Adelaide and Port Augusta, it is the longest alternating current system in the world. Has about 40,000 km of transmission lines and cables. Supplies about 200 TWh of energy to businesses and households each year. Is long and linear compared with Europe and North America. Can be costly to upgrade because of the large distances. Want to learn more? Get in touch with us today.